Forget canvases. Forget dull poses. Forget all that. That's exactly what artist Hikaru Cho is doing, so you should, too. Here, you are looking at Beat Takeshi—well, a painting of Beat Takeshi. In case you are not familiar with Takeshi, he's a famous movie director, actor, and comedian. He also starred in a notoriously difficult video game. This painting of him is most unusual. Hikaru Cho (aka "Chooo-san") is a young Japanese artist Kotaku featured last year. 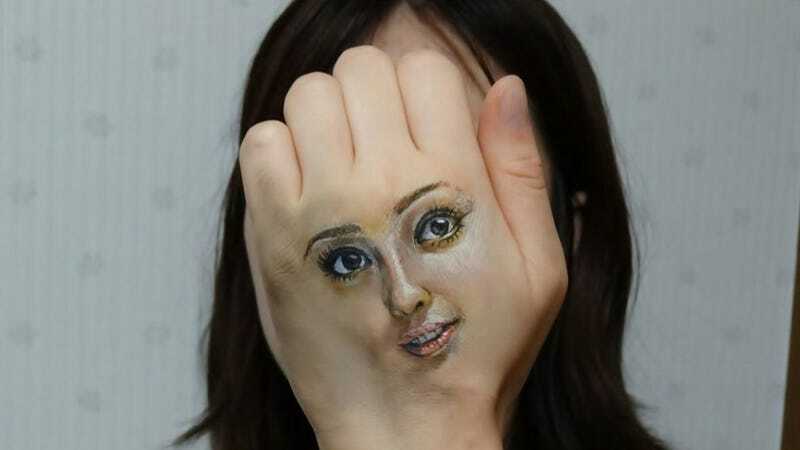 She uses acrylic paint to create her unique body art. As previously mentioned, she began doodling eyes on her hands while taking study breaks. The art was so cool and interesting that she started uploading pics to the internet. Even though Cho is still in art school, she's already gained the attention of some of Japan's biggest celebrities. Below, check out her body art of and with major Japanese stars, like singer and actress Anna Tsuchiya, influential producer Terry Ito, and big time comedian George Tokoro. Up top, that's model Nozomi Sasaki. Here, you can see how the Beat Takeshi painting compares with the real Beat Takeshi (next to Takeshi with blond hair, that's George Tokoro).